The shallow Don Juan Pond is almost 45 percent salts by weight. A shallow, briny pond located in the most Mars-like region on Earth is probably being fed by groundwater seeping up, rather than moisture seeping down from the atmosphere, providing clues as to what stores of liquid water, if they exist, might look like on Mars. 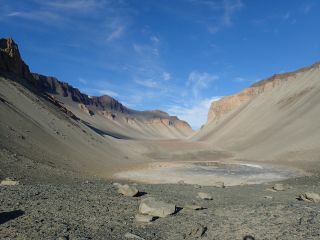 The Don Juan Pond, found in Wright Valley among the McMurdo Dry Valleys in Antarctica, is one of the saltiest pools of water on the planet, even more so than the Dead Sea. Covering an area of about 330 feet by 985 feet (100 by 300 meters) but just 4 inches (10 centimeters) deep, the pond contains enough salt for the water to remain liquid even at minus 58 degrees Fahrenheit (minus 50 degrees Celsius), typical of temperatures on Mars. Putting this theory to the test, researchers led by Jonathan Toner, who is a geochemist and assistant professor at the University of Washington, ran two simulations: one where Don Juan Pond forms from a deep groundwater aquifer, and the other where moisture from the atmosphere seeps into the lake from above. Toner's team found that the pond's distinct chemistry, rich in calcium chloride, is best produced by an extensive groundwater aquifer. The calcium chloride forms when briny films percolate into the frozen soil and interact with minerals. The dark streaks, which the 2013 research suggested was snowmelt trickling downhill, are also enriched in calcium chloride, suggesting they are also produced by the aquifer. "Where else do you have salt-rich, cold soils? The entire planet of Mars!" Toner told Astrobiology Magazine. "We think that similar calcium chloride plumes could underlie much of Mars' surface and, as in the Dry Valleys, upwelling groundwaters on Mars could form recurring slope lineae." A satellite image of Don Juan Pond, showing dark streaks on the surrounding hillsides that look eerily like the recurring slope lineae seen on Mars. Toner said that the jury is still out on whether Don Juan Pond’s salt levels are too extreme for life, but nearby lakes that are presumably fed by the same aquifer do have life. By extension, it leaves the door open for life existing in similar environments on Mars. In December, Toner will embark on a NASA/National Science Foundation-sponsored expedition to Don Juan Pond to measure its chemistry, take soil samples and determine how the pond changes over time, putting his model to the test. The research, published in September in the journal Earth and Planetary Science Letters, was funded by a NASA Habitable Worlds grant. This story was provided by Astrobiology Magazine, a web-based publication sponsored by the NASA astrobiology program. This version of the story published on Space.com. Follow us @Spacedotcom, Facebook or Google+.